Good performers avoid "me-versus-them" situations by breaking down the wall between themselves and an audience. 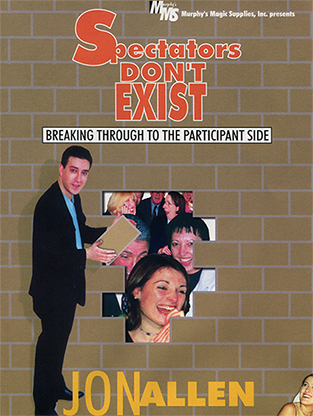 In Spectators Don't Exist, professional magician Jon Allen explains how to even the most passive of "spectators" into enthusiastic "participants." Jon opens a Pandora's Box by performing for people in the real world, then giving in-depth analysis. The people are not primed, there is no rehearsal and no re-shooting. There is only one chance with them. If you want to learn how to get people involved in your routines and create better reactions, this video is for you. The valuable information within comes from the experience of thousands of professional performances. You'll learn how to: approach a table, deal with interruptions, make routines more "viewer friendly," and involve a whole group of people in your magic. Ghost A stunning 3-phase routine in which a borrowed bill is isolated within a wineglass but still becomes animated... even while someone else is holding the glass! The Jerk Don't just unlink the bands. The Third Man Two people join in for a powerful penetration of the bands. Learn Jon's simple technique to significantly enhance the effect on the audience. You will add it to your routine straight away! The Hand That Rocks The Cradle Learn how to break a rubber band and actually restore it around someone's wrist! Ambitious Card and The Destination Box Priceless to the working magician! Jon's Ambitious Card routine is direct, strong, full of audience participation and practical. The Destination Box is a revolutionary version of the classic Card to Box. Many top professionals have acclaimed Jon's version as the benchmark for this classic effect. Thought of Card In Envelope A thought of card appears in a signed, sealed window envelope in plain view throughout Also included is Jon's "Thought-of Card on Ceiling." Freddy's Dead Jon's ingenious work on the classic "Professor's Nightmare" including a new, remarkable false count and a finish that allows someone else to hold onto the ropes as they change length! Considered by many to be the best handling to this classic routine. Jon Allen is a full time professional magician who has worked for a wide spectrum of people including the general public, business leaders, royalty and celebrities. Jon has also been honored with some of the top awards by his peers including: the Ron MacMillan International award winner (1994), IBM Close-up Champion (1995), IBM British Ring Close-up Champion (1998), British Magical Championship Award Winner (1999), The Magic Circle Close-up Champion (2001).